For HTTP monitors it downloads a specified URL. For FTP or SFTP monitors it can download any file from the server. For Telnet or SSH monitors it executes a script on the remote server and receives its output. For Console monitor it receives the console output. 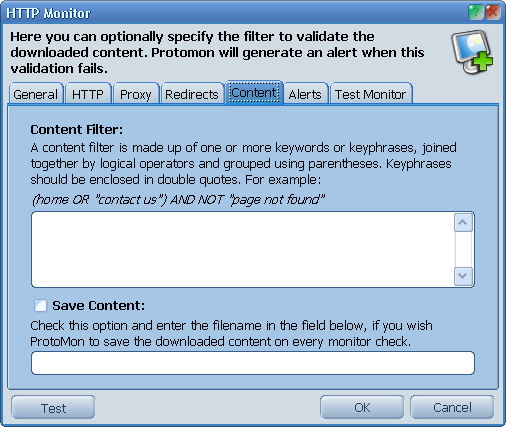 The program can check this content against the specified rules, and trigger an alert, if this check fails. (home or "contact us") and not "page not found"
Additionally, ProtoMon can save the content on disk. This allows you to open the source data in some text editor, and easily copy and paste the phrases to the filter.